In a perfect world, business owners would not have to worry about anything going wrong. In reality, however, we live in a world of uncertainties, one that is fraught with hazards, accidents and other unfortunate circumstances that can and do happen all the time. A customer getting injured within a shop's premises, an employee unintentionally damaging client property, or a small business needing insurance for encountering difficulties for allegedly failing to satisfactorily perform a service — these are just some of the risks that organizations face on a daily basis. With the possibilities being so numerous, a commercial general liability insurance policy is something you truly cannot do without. Depending on the type of coverage you choose and on your policy limit, our commercial general liability insurance policies can help you cover the costs of your legal defense and medical fees if you are found liable to the claims. Finding the best policy provides you peace of mind. There are many factors that go into calculating insurance cost. Size of company, experience in industry, claims history and nature of work are a few, but many more are applicable. As hard as it is to ballpark a rate without understanding these details, we can provide to you some average rates we’ve seen recently. We recently insured a 1 owner, self employed startup in a low risk industry (Painters, handymen, HVAC, light remodeler, etc) for an annual premium of just $900. Another midsized business with multiple employees, medium risk (concrete, plumbers, general contractors, carpentry framers, medium risk industries) and a clear claims history was only $1,675 annually. We also insured a large established company who had many employees, high gross receipts and was engaged in higher risk business (roofers, large scale general contractors, welders, garage keepers) for about $4,500 annually. Remember that rates vary and almost each client is different. So take this information as a rough guideline only. How do I start coverage? Starting coverage is easy. Simply CLICK HERE and complete a quick web form or call 844-756-8684 to speak to us directly. No office visit is required and we can complete your paperwork online and place coverage on the same day in most cases. How is Quote Texas Insurance different from other Agencies? We at Quote Texas Insurance understand the needs of business owners like you. We have a comprehensive process that will help your business get protection coverage that's tailor-made for your organization's specific requirements. We are an Insurance Brokerage and thus have no allegiances to any specific carrier. This means we represent you, not the carrier. This motivates us to find you the best rates and coverages from over 65+ carriers that we utilize. In addition, our staff is fully trained, licensed and approved by the State of Texas Insurance Regulatory Board to provide the service you demand on your policy. 8 Ways we help to make your insurance SIMPLE. Quote Texas searches 65 top rated carriers to find the best match for your unique business needs. 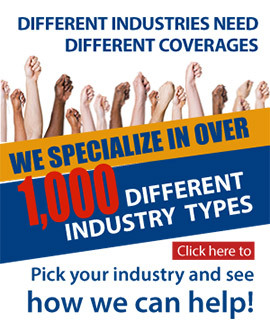 We speak directly with underwriters to ensure that only the most appropriate coverages are selected. Using our insider knowledge, we play insurers against each other for the best pricing available. We’ll eliminate any carrier that is unwilling to meet our client's specific coverage needs and options. We then compare quotes for rates and coverages from only the best of the top carriers remaining. We advocate for you, listing recommendations and discussing with you all your quote options. We rate each company based on Ease of Use, Financial Rating, Value, plus Coverage and Cost. We never require an office visit; completing your policy over the phone and web is fast and easy. No other Agency will work this hard for you. We promise! We encourage you to consult with our team of professionals whose focus is to "Make Insurance Simple." Find out more about how we can help you come up with the most cost-effective coverage plan that meets your needs. Feel free to contact us today!